Has given itself to me. Our Portuguese friends have been a great hit in the school right from their arrival at Monday’s assembly where they introduced us to their wonderful voices and instruments. Through their visits to the classrooms they fully engaged our children with improvised musical instrument making, singing, dancing, cooking and storytelling. We have certainly tasted the flavour of Portugal, with their finale taking place in the hall today, what a celebration! On behalf of the school I offer our thanks to Andre, Eduardo and Claudio for sharing their warmth and talents with us this week. We wish them well on their return to Portugal. Thank you also to Danilo for all the organisational efforts that made this visit possible. Canteen day kicked off this week and was highly successful. Over 70 meals were ordered and the sounds of satisfaction were heard all around the school. We hope this initiative can continue and we thank Julie and her wonderful team for bringing the idea forward and then carrying it through. Sibling discounts have not formerly been applied to parents who have had children in the Kindergarten and in other classes in the school. After consideration at both Management and Board level we have decided to offer the Sibling discount retrospectively back to the beginning of this year. If you have children in Kinder and in other parts of the school your accounts will now be credited. 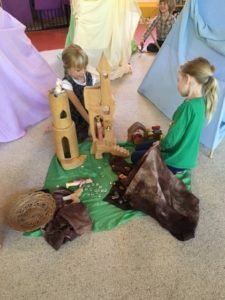 We recognise what a wonderful journey it can be for children to enter at Playgroup with Mum or Dad, spend some time in Ring-a-Rosie, move through Kinder and Prep and begin their journey onto the rest of the school and we would like to make this more affordable for parents of multiple children. Heather will have a book outside the classroom that parents will need to sign if someone other than the parent/guardian is picking up the child that afternoon. Also, it is important from a safety perspective for parents who pick children up from our Early Years program to keep the littlies close to you when going to pick-up older siblings. Welcome to the first buds of Autumn. There is a sense of anticipation in the air, as our mornings become cooler and days a little shorter. Last week at Kinder one of the children found a yellow leaf. “Oh look”, they exclaimed, we were all very surprised. Is it really that time already? We also shared a delightful afternoon with Ann and Kaori. 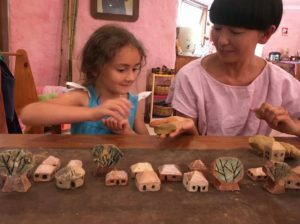 They are artists in Castlemaine who are running a program that stretches across all the Preschools and Kindergartens in the Mount Alexander Shire. They are spending time in each Preschool/ Kindergarten and talking to the children about houses and homes, towns and communities. It was a lovely opportunity for the children to reflect and share some of their own thoughts about their community and their home with each other whilst they created their own little, and some not so little, homes. They also had the opportunity to build up a town of their liking. They built gardens, placed trees in parks, made soccer balls for lots of soccer fields, built biscuit factories, made trains for the station and so much more. It was delightful to hear their chatter about where they live and what is important to them in their community. 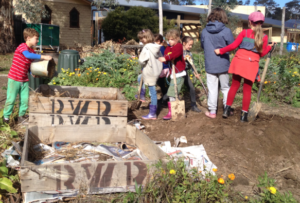 We are having a working Bee on Tuesday 21st March 8.45am to 12.30pm. In the Autumn garden, scarlet evening grow Apples ripening, brightening, ripening Leaves so golden grow. We are enjoying playing in the garden these Autumn mornings. Golden leaves are beginning to flutter down, there are plenty of ripe tomatoes in the vegetable garden and our hens are laying us warm eggs each morning for our baking. It has been lovely to welcome Tilly back to Prep this week. Congratulations to Hellie, Andy and all the family on the arrival of their baby boy. Thank you to parents who attended our Class meeting on Monday. For those unable to attend I will put some articles for you to read in your child’s locker. There are Parent Teacher meetings for Prep on Friday 10th and 17th March. If you would like to catch up for a chat, please put your name on the lists outside the classroom. Our Prep Autumn Festival will be on the last day of term, Thursday 30th March, an invitation will go home soon. Class One have been off adventuring with old man Numero, helping him to find his number friends. They have travelled for days, first heading north, then east along a mountain range and south to the ocean. I’m fairly certain they’ll be heading west to make their way back home. Using bright and sharp eyes they found some pretty interesting numbers in nature, such as six in both the cells of a beehive (we were very lucky to have some fresh honeycomb to taste) as well as discovering that snowflakes have hexagonal formations too. The number seven was found in a beautiful rainbow that appeared above the snow covered mountain. With the lovely warm afternoons many children have been enjoying excavating and making rivers and deep dams in the sand pit. This week we spent a lot of time with our Class 6 buddies for Portuguese Multicultural Week. We danced, sang, learnt some new words, listened to beautiful music and singing and really enjoyed making musical instruments from odd bits and pieces. Class 2 have been enthusiastically working with the beautiful, inspiring American Indian, First Peoples stories to revise all our letters and sounds, create sentences, practice our handwriting and enhance our drawing skills with our crayons. As well, we have made origami canoes, seed form drawings and corn dolls after cooking our corn on the cob. We have worked well with each other to learn the games of Crows and Cranes and Indians and Tipis. As well as all this Class 2 energy – the messages within the stories bring us calm, gratefulness and thoughtfulness for Mother Earth along with all that comes from and all that supports her. Small Class newsletter with dates out last week. Please let me know if you did not receive one. Salutes To The Sun; meditation and chanting; The wonderful stories of The Ramayana and The Mahabharata are surrounding class five as we explore Ancient India, much of which is still part of present day life in India. Thank-you Acintya for spending a session with us, sharing your contact with India. Thank you also for items and books sent in. We are also preparing for our 4th term Olympics, practicing sprints, marathons, relays, wrestling, long jump and next term, javelin and discus. This week we have been focusing on listening well to each other. Class 6 have commenced a new Main Lesson in Astronomy. The aim is to briefly introduce and orientate to aspects of the indigenous cultural background based on the Boorung clan’s view of the creation and stories about the stars found in our Southern Skies. These indigenous people from Lake Tyrell, near Swan Hill, lived in the country to the north of the Dja Dja Warrung country where our Loddon Plains Field Trip and canoe camp will take place next week. Our trip will follow the course of the Loddon River to Boort and culminate in paddling the Serpentine Creek Canoe Trail as part of our Geography, History, Visual and Performing Arts program. We are all looking forward to this expedition and being in the company of each other along with our guides and guest speakers who will join us along the way. Many thanks in advance to Lisa Hall, Kerrie and Chloe Outdoor Ed graduates involved in forming the canoe trail and to all Class 6 parents for their support and generosity in preparing their student for the Field Trip. is early in Term two and forms will be sent out regarding this shortly. are doing lots of singing and playing great music and generally having loads of fun in between working hard. Well done to all of our French students who are settling into their working routine for Term One! In Class Six we have explored the days of the week in French and their links to the names of planets, as the class approaches the theme of Astronomy in their Main Lesson work. And we have also taken a little time out to create a masque de carnevale for the occasion of mardi gras … never forgetting of course that this translates as ‘Fat Tuesday’ – the day on which families traditionally used up all of their butter and milk and eggs before the season of Lent – or, le careme. And what better way to use these up than with the making of crepes! Class Seven and Eight are now busily investigating the lifestyle of the Sun King Louis XIV and discovering how very different it is to our own, in a Main Lesson related unit of work called Le Roi Soleil et Moi. We have compared modern dress – les vetements – to the silks and velvets at the court of Louis; discovered that after a typical thirty course meal guests may need to nibble on edible candles as they returned to their chambers … and we were able to access the wonderful website of the National Gallery of Australia to view the magnificent collection currently on display in Canberra: The Treasures of Versailles. And finally our French storytime in the library (each Tuesday, 1.15 – 1.45) is off to a flying start. Our first storybook was La Poule de Handa (Handa’s Hen) and we look forward to Madeline next! If anyone has some spare time, we always need extra help in the garden. Everyone is invited to join me Monday mornings after assembly in the vegetable garden behind the Eurythmy Room for a lovely session of gardening. You are welcome to work in the garden at any time that suits you if you are unable to come on Mondays. We will be performing as part of the youth choir at the Singing From Country concert on Wednesday, 22 March at 6pm at the Castlemaine State Festival. The rehearsal of the combined choirs will take place on Tuesday, 14 March from 5.30 to 7pm at the Presbyterian Church in Castlemaine (opposite the Art Gallery). Parents are welcome to come and sit in the church to listen to the rehearsal. You may especially wish to do this if you aren’t planning to purchase a ticket to watch the concert on the 22nd. For the performance, the children are requested to wear a plain earth-coloured t-shirt or top. Suggested colours – browns, reds, greens, blues, yellows, oranges, greys (not fluoro just any colour that evokes the earth/natural landscape). Plain black bottoms, i.e. trousers, skirts, leggings or shorts are all fine. Rehearsals at school will continue each Wednesday during lunch time. If you need a copy of the lyrics or the song recordings, please contact Julie (0420 318 255) or Carl (0404191009). Hello everyone. It is so nice to be back teaching the Craft program and wonderful spending time with the children once again. The beginning of my year was quite a shock for me and my family, spending between Christmas and New Year in hospital. Finally I am back, feeling inspired and motivated to help the children in the making process of their projects. A huge Thank -You to Kate Dew who graciously stepped into the role of Craft teacher for the first four weeks of term and did a wonderful job. I felt relaxed and confident with Kate in charge. I also need to acknowledge my daughter, Iliah, who spent her first week of Christmas holidays, working daily to help me complete some projects for the children. At this time I was too unwell to work so she completed the required projects independently. All the classes are working well and are right on track to complete their projects in the next few weeks. Last year I donated my Pottery Kiln to the school and just this week the safety requirements have been carried out. Finally I can fire the Ceramic pieces made over the last couple of years. Thank you all those who helped this happen. I am off to the Lost Trades Fair on the long weekend and can’t wait to witness the various traditional crafts. I am going with the Spring Fair Art and Craft Exhibition flyers to hand out to as many Crafters I can, to help promote our school. Enjoy the weather while the sun still shines. Thank you for the tremendous support for our first school lunch this week. Sujeeva’s veggie pasta was really well received by the children – most of whom didn’t suspect there were lots of vegetables blended into the sauce 🙂 Next Monday is a holiday, so our next lunch will be Monday, 20 March. We’ll send home an order form for those who haven’t already ordered. We’ll set up a table so that parent helpers can sit down together for a social lunch after we deliver food to the children, so come along on the 20th if you’d like to help out and sit around eating for a little while before dishwashing. The craft group is working on Easter crafts over the next few weeks. Camila Serrano who creates beautiful work under the name Felt and Grain has offered to take us through needle felting at a special craft workshop on Friday, 24 March from 9am. You can make lovely little animals or perhaps decorate felt eggs for Easter. Thank you to those that have returned forms, copies available at the office if needed. All children with Anaphylaxis, Asthma or Allergies must have an updated Action Plan for 2017. Anaphylaxis Action plans must be completed by a Medical Practitioner. It is recommended that Asthma and Allergy Plans are completed by a Medical Practitioner also, but can be completed by parents, forms are available at the office. Lost at School – Swatch watch – Blue band with pandas and bamboo on the face. My name is Rosalie and I’m a young Canadian woman from Quebec actually travelling through Castlemaine. I was please to hear from the Steiner school as I was educated of one of the only two Steiner’s school in Quebec. A great education which I’m now taking through life! Please excuse my directness but I through I would make a call out to you and this Steiner community to see if anyone could help me out with some accommodation during the Castlemaine State Festival. I’m excited to be volunteering at the festival and was thinking it would be wonderful to also spend some time with some of your Australian Steiner community. I am currently having a wonderful volunteering experience close to Yandoit Farm and I’m looking for a place to stay from the 17 to the 26 of march. Somewhere close to Town would be handy so I would not be a burden to anybody with transport, etc. And I would be pleased to help out any host in between my responsibilities at the festival! Morning Star Crafts supplies Steiner inspired art and craft materials, books, toys, gifts and more from our base in Campbells Creek. We are moving to a lovely new studio space, also in Campbells Creek, and to celebrate we are offering 20% off absolutely everything in stock for the rest of March. We will take a break to settle in during April, so order now for the holidays and Easter and save. Phone orders – contact Elizabeth on 0458 280 547. Moral Technologies is a new and exciting initiative of Seed Australia exploring the theme of being human in the age of technological development. In April 2017 we will host Orland Bishop (founder and director of Shadetree Multicultural Foundation USA) for a four-day intensive event at a retreat centre in Templestowe, Melbourne. We will dive deeply into exploring different facets of our humanity and our creative potential, and how that relates to the time in which we live and the rapid developments in technology. Book through the website www.moraltechnologies.com or contact Rose Nekvapil – rose.nekvapil@gmail.com. We have at our disposal two tractor tyres that are looking for a new home. If you can utilise them as a sand pit, vegie garden or with a liner as a pond please get in touch. The options are endless. Tyre 2 This tyre has some white paint on the inside and a few splashes over the top, you can call past and inspect or I can send a photo. You will have to arrange pick up but assistance can be given to load up from this end. Families are welcome to come along for a hit as court hire is available.